As the United Nations marks its 70th anniversary this weekend, we face one of the most severe hunger emergencies since its founding. The civil war in Syria and conflicts in Iraq, South Sudan, Yemen, Ukraine have left millions of people homeless and without food. Ethiopia, Central African Republic and other nations are also at risk of famine in the coming months. The MSJ Impact Cincinnati Group has created a great way for you to help them, and all you need is a smartphone and your spirit. They are hosting a Charity Miles walk-a-thon for the World Food Programme (WFP), the largest hunger relief organization. The WFP depends entirely on voluntary donations. Because of low funding the WFP has been forced to reduce rations for war victims. To help, you need to download the app at www.charitymiles.org, select World Food Progamme from the list of charities, and start walking, running or biking. Every mile means a donation of a meal, paid for by corporate sponsors. This is a tremendous way for you to be a food ambassador, raise donations for WFP and make an impact statement. Your actions will show that the hungry, even though thousands of miles away, are not forgotten. Mount St. Joseph historically has responded in times of great distress. After World War II, MSJ answered the cries for help from overseas with massive food and clothing drives. The Mount school newspaper wrote “How did we, a small college… perform such a tremendous task.” Leadership and spirit for helping others guided the Greatest Generation. Now is your time to step forward and meet the challenge of today’s world, which tragically again is hunger and insecurity. 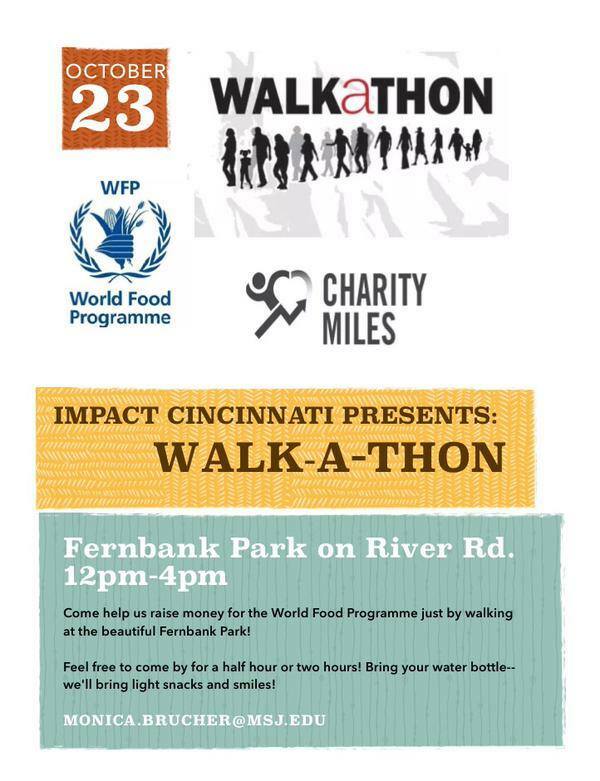 The MSJ Walk-a-thon for the World Food Programme is this Friday, October 23rd from 12-4 at Fernbank Park on River Road. Even if you cannot attend, you can still do Charity Miles for the World Food Programme at any time. In the profile section of the app be sure to join the impactmsj team. Please contact Monica Brucher with questions at monica.brucher@msj.edu. Please share your own story of your Charity Miles.